The alaTest USER review solution manages the collection, moderation, tagging, publishing, sharing and syndication of your user generated content. The solution is designed to maximize interaction with review functionalities and stimulate content creation with users. Trustworthy product information at the point-of-purchase increases sales conversion, order size and repeat purchase. 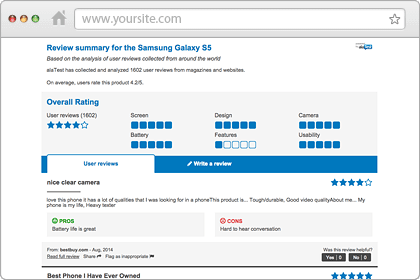 Collect and display reviews to visualize world opinion about a product. Independent and objective product quality information builds trust. Generate direct feedback from consumers on products and service. Optimized user review collection program to stimulate user engagement and content creation at multiple touch points. Facilitates display of more reviews for more of your products early in the product life-cycle. 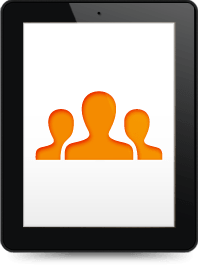 Pre-loaded with expert reviews to enable clients to display rich reviews from day one. Review content is updated regularly. Users can easily share and discuss product information with services like Facebook, Twitter, Email. Engage your users to improve the quality of reviews and further the discussion around your products.